Just as how mobile smartphone applications (apps) opened up a whole new world of computing power, Distributed Applications (DApps) offer many exciting benefits. Rather than being run on any one central server or computer, the processing is spread out over an entire network of nodes which contain copies of the blockchain. This is what makes it both so difficult to hack or take down, and also stops the creators of the game from being able to change anyone’s cards or issue new series. So, in order to run a DApp you must first connect to a blockchain node. This can be accomplished by either running a node yourself (rather technical, not generally recommended) or connecting to another node through MetaMask (Extension for desktop browsers like Chrome, Opera, Firefox) or Cipher Browser (iOS and Android) or TrustWallet (iOS and Android). Note: You only need to do the following steps ONCE, and then you will be able to connect to EVERY DApp. Also, doing this removes the need to log into every site with a different username/email/password, etc. 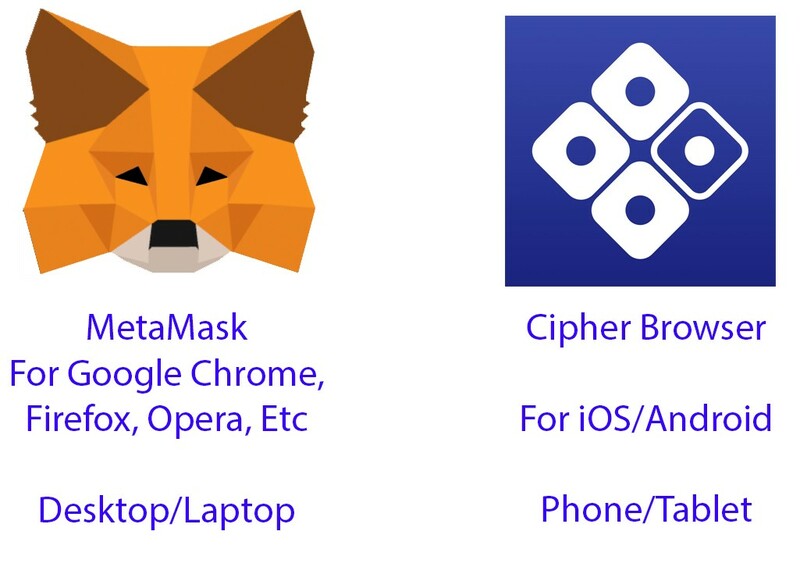 Step 1: Download Either MetaMast (https://metamask.io/) or Cipher Browser (https://www.cipherbrowser.com/). These programs are safe and used by many people all over the world. Step 2: Setup — When you first start you will get a set of 12 recovery words. It’s very important that you keep them somewhere safe. If you ever forget your password/lose your computer/flee to another country, you can completely restore ALL your accounts just by knowing these 12 words. Of course, that means anyone else can do the same, so keep them safe. You can also cut them in half and store in 2 separate locations. Detailed MetaMask Video. Choose a good password or use your fingerprint (for mobile). This is used to encrypt your private key. So, even if someone steals your phone or hacks your computer, they still won’t be able to see your key without your password, and you can just restore your account with the 12 words above. Protip: If you want to use the same account with both your phone and computer, create the account on one and restore it with the 12 words on the other. From Fiat (USD, Euro, Won, etc) — You will need an account at an exchange like Coinbase. Buy some Ether and send it to your MetaMask/Cipher address. Sell Products/Services — If you run a business, you can offer your customers to pay you in Ether. Change other Crypto — If you already have bitcoin or other cryptos, you can use services like Shapeshift to transfer it to Ether and send it to your account. Buy From Friend — You can give your friend fiat and have your friend send Ether to your address. Your account is a public identifier that lets sites like AngelBattles know which cards you have. You can create as many accounts as you want, so you might want to create a separate account for each site or group of sites you visit. It’s easy to switch between them. Although the process can seem complicated at first, once you understand how it works you see the power of browsing the web in this way and it’s very easy to access any other DApp.